Memorial Day Sale on our Basic Tees! 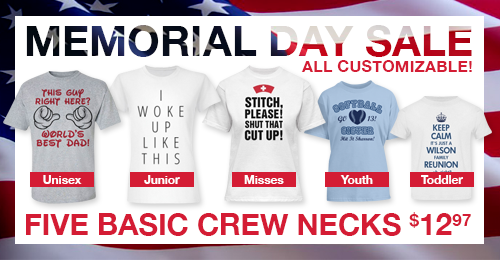 We’re Crew Neck Cray and having a Memorial Day Sale! All of our Basic Tees are on sale for only $12.97! That means you can create a one-of-a-kind tee for less than it costs for 2 Chipotle dinners, a 20 minute cab ride, or a round of coffees for the office. Use this limited-time-sale to customize Dad a shirt for Father’s Day, outfit the whole team with new warm-up tees, or design shirts for the family reunion coming up! The $12.97 Basic Tee Sale ends Memorial Day so hurry and customize today!